Most of the business models in today’s world are designed to truly suite the vendors’ basic requirements. Any vendor primarily thinks of mitigating his own business risk first and then the clients. For clients this leads to loss of true essence of delegating. The inclination towards delegating is greatly dependent on risk and cost involved. The client today aggressively looks at low cost, less risk and optimum quality of resources. We at IzelTech put ourselves in our clients shoes and design a business model that is truly suitable and perfectly workable for our clients. 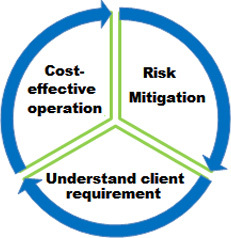 Risk mitigation and cost effective operational methodology are the most important factors we focus on. However, quality comes with a cost and we believe in absorbing that cost overhead ourselves rather than passing it on to our clients. We have made a conscious effort to build a truly risk free revenue sharing business model. We believe our business thoroughly depends on our client’s satisfaction levels. We will strive hard to keep up with our commitment to stick to our delivery deadlines, have quality resources on board and keep our operational costs low. We are sure our clients would appreciate this business approach of ours. The key components of the environment are our People and Culture. We hire product developers who are trained to design and build products as opposed to implementing IT projects. 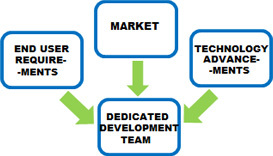 IzelTech maintains an environment that is highly conducive to product development with ownership and responsibility. Rolling out high quality software on time is the holy grail of software development. This is hard to do for various reasons. As the product evolves, there are changes in market understanding, customer priorities, etc. that result in constantly changing specifications. Maintaining a predictable product development schedule when the definition keeps changing is difficult to manage. IzelTech has evolved a process that manages this task effectively. It ensures constant predictability as changes are accommodated. Successful products have superior user experience. Delivering such experience starts with a clear understanding of the target market and end users. The entire dedicated development team must be capable of understanding the market, competition, the buyers and the needs of the end users. Such an understanding translates into proper modeling of the product, along with a vision and roadmap that lays out the various release cycles over which complete functionality is delivered. IzelTech understands this process well and helps our clients build products with great user experience. We bring an in–depth understanding of diverse technology competencies and Service Oriented Architectures. But most importantly, we bring an attitude that has made it a religion at IzelTech to design before you code. We think through many architectural and design aspects such as scalability, sustainability, security, robustness and simplicity for every architecture we come up with. We firmly believe that Delivery Excellence results when the operation as a whole is greater than the sum of the parts. At IzelTech, delivery excellence is about making sure we achieve our “Depend On Us” promise. Clients come to us to meet their immediate business challenges and to provide long-term value through continuous improvement. Our world-class delivery capabilities bring together our highly skilled professionals with our global reach, industry insights & innovative solutions–all directed towards generating measurable business value for our clients through reliable, cost-effective and consistently high-quality service. 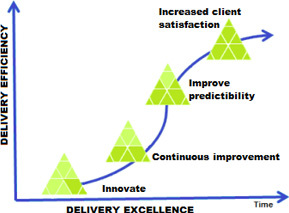 The mission of Delivery Excellence is to contribute to the long–term success its customers by consistent delivery of cost-effective and value-added innovative solutions that meet requirements, exceed expectations and contribute to profitability and highly satisfied customers. With a strong and dynamic team of professionals with over 555 years of cumulative experience in designing, developing, testing and building software solutions for several product companies, we push the boundaries to make things better, more robust, cost-effective and faster for our customers. Clients value IzelTech for its unbiased recommendations and seek our advice on finding new and creative solutions to solve their needs and challenges in the cloud computing, virtualization, storage and networking domains. We effectively blend technological expertise with domain knowledge. IzelTech provides intelligent performance enhancing, cost reducing, optimally managed solutions that dramatically simplify and accelerate the return on investment in the cloud computing, virtualization, storage and networking domains.